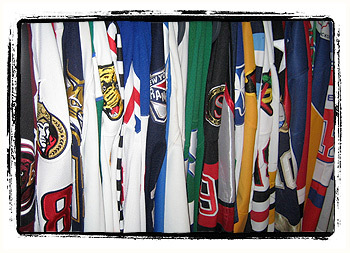 In the past I’ve talked about one of my hobbies — collecting game worn hockey jerseys. I know, I know, totally weird to some — c’mon, dirty polyester? But seriously, there’s a pretty sizable following and if you can believe it, the economy within the hobby is strong. My best jersey commanded nearly 5-figures at the height of the boom (October 2007) and today, well, it still commands that same amount. Almost makes it a wise investment, right? But the one downside to this hobby of mine is that for years it sucked me dry. Much of my former credit card debt can probably be attributed to my collection — I was easily dropping in excess of $500 per month, on average, adding to the collection. That’s a lot of money. Some may even say it was wasted money. They might be right. In 2008, I scaled it back. A lot. Then, in June, I noticed that I hadn’t made a purchase in over a month — and I wasn’t really missing it. Same thing in July. August, and then September! Had I kicked the addiction? Last week I bought a jersey on the secondary market (yeah, this bizarre hobby is big enough to have a very busy secondary market) for $115. Anything under $300 is peanuts in this hobby so, for a sum that small, it’s not likely to increase in value anytime soon, or ever. Probably not a wise investment. But, at the same time, for such a small price, I just couldn’t resist. And that’s the bad part. This jersey’s arrival in the mailbox has me re-energized. Just today, I was already pricing out $600-$1000 jerseys… Crazyness. Awesome! My 401k is Down Over Twenty Percent this Month!